SkinnyFit Detox is a simple, natural, and effective detox that helps boost metabolism, fight bloating, and release toxins from the body. SkinnyFit Detox is made with 13 powerful, all-natural superfood ingredients that work together to help you get your best results. SkinnyFit Detox is expertly formulated with a blend of 13 superfood teas, herbs, and berries designed to energize the body, kickstart metabolism, and release toxins. Our signature blend contains natural metabolism boosters which help your body get rid of those extra pounds. Our all-natural blend promotes healthy digestion, helps your body shed water weight, relieve uncomfortable gas, and deflate your belly. SkinnyFit Detox is high in antioxidant cleansing power that helps flush out harmful toxins that build up over time and fight damage to your cells. 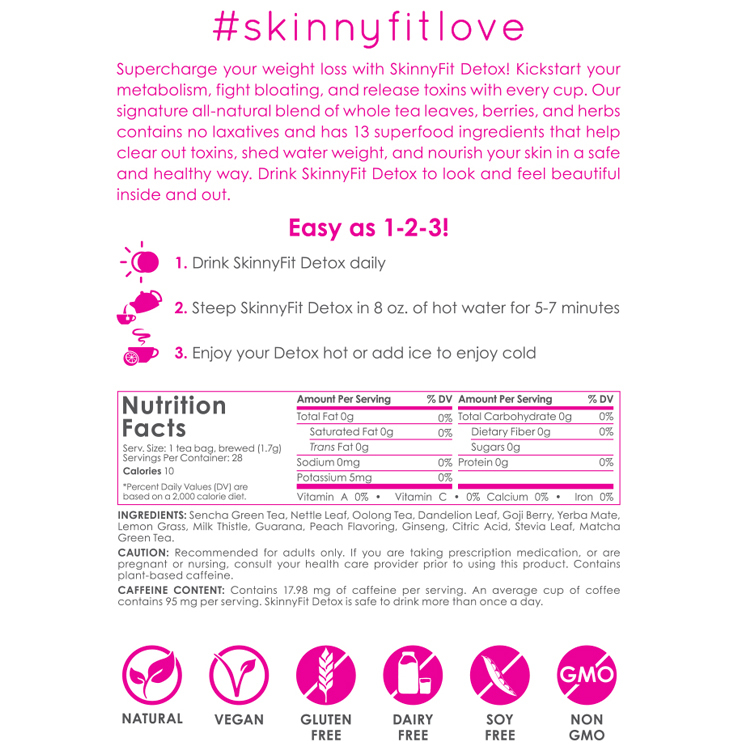 SkinnyFit Detox is designed to be a daily drink. Consistency gets you the best results. You can take it anytime, with or without food. You can even drink it more than once a day we do suggest drinking it in the morning or afternoon. We also recommend that while on the detox you eat whole food as well, like more fruits and veggies, and avoid junk food. Your body is detoxing so you have to help it out by not adding any junk to it. SkinnyFit Detox is for anyone who wants to live a healthier lifestyle! It’s an all-natural way to kickstart your body and give you that extra boost to reach your health goals. If you’re pregnant, breastfeeding, have preexisting medical conditions, abstaining from food (fasting) or under the age of 18, we recommend that you consult your healthcare provider before doing a detox. How should I use SkinnyFit? We suggest you start each morning with a mug of SkinnyFit about 30 minutes before you have breakfast. Simply pour 8oz of barely boiling water over one bag of SkinnyFit and allow it to steep for 5-7 minutes. You can also enjoy a second cup later in the afternoon or before a workout. Are there any laxatives in your teas? Yes, SkinnyFit contains approximately 17.98 mg of caffeine per tea bag as compared to regular teas like green or black tea which have anywhere from 30-50 milligrams and coffee which has about 95 milligrams per cup. In the rare event that you should experience any side effects from using SkinnyFit Detox, discontinue use immediately and contact your physician. The information and suggestions on SkinnyFit.com are not intended to replace the consultation of your doctor and should not be relied upon as an alternative to the advice of your healthcare professional. The citric acid in SkinnyFit is derived naturally from sugar cane. It is USP-certified for quality, strength, and purity. What are all the ingredients in SkinnyFit Snack Attack? 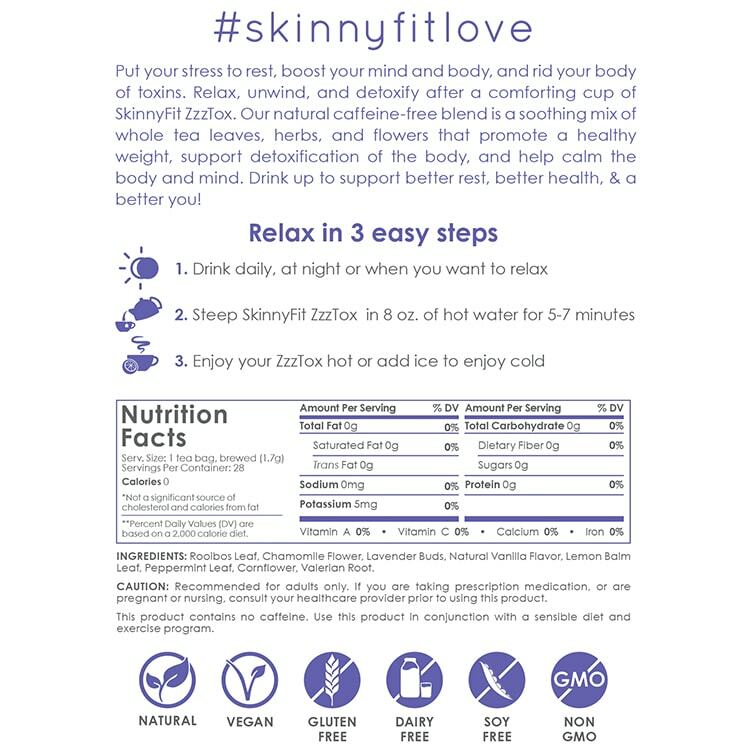 What are all the ingredients in SkinnyFit ZzzTox? Rooibos Leaf, Chamomile Flower, Lavender Buds, Natural Vanilla Flavor, Lemon Balm Leaf, Peppermint Leaf, Cornflower, & Valerian Root. What are all the ingredients in SkinnyFit Belly Balance? 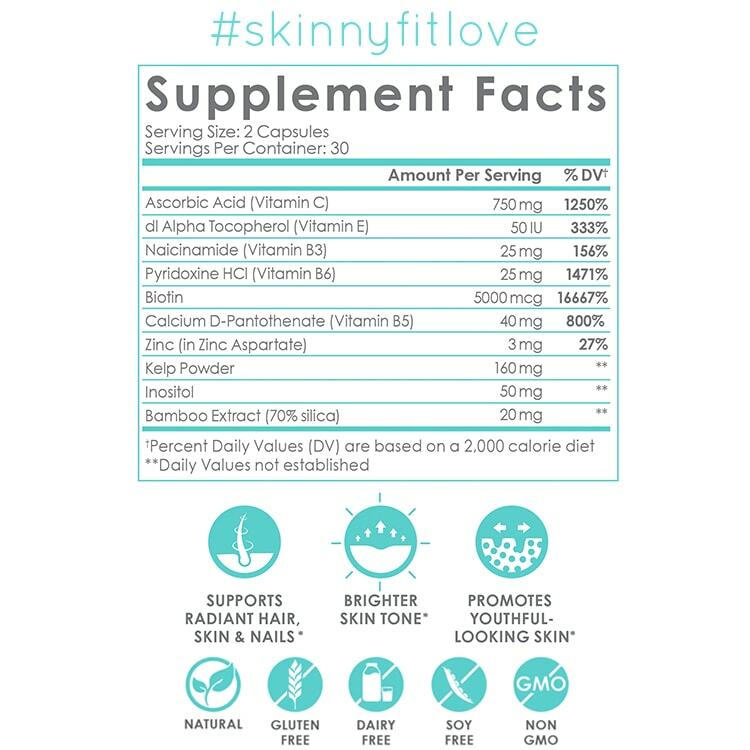 What are all the ingredients in SkinnyFit Daily Glow? Ascorbic Acid (Vitamin C), dl Alpha Tocopherol (Vitamin E), Naicinamide (Vitamin B3), Pyridoxine HCI (Vitamin B6), Biotin, Calcium D-Pantothenate (Vitamin B5), Zinc, Kelp Powder, Inositol, Bamboo Extract (70% silica). What are all the ingredients in SkinnyFit Jump Start? What are all the ingredients in SkinnyFit Repair & Recover? What are all the ingredients in SkinnyFit Super Youth? Hydrolyzed Bovine Collagen Peptides, Hydrolyzed Fish Collagen Peptides, Chicken Bone Broth Collagen Concentrate, Eggshell Membrane Collagen. 100% Natural & Non-GMO. Not only do our ingredients work – they’re good for you! We don’t use artificial sweeteners, fillers or unnecessary additives to mask the genuine earthy flavors our teas create on their own. This popular tea makes up about 80% of the tea produced in Japan. These nutrient dense leaves are packed with catechins, vitamin C, beta-carotene, folic acid, saponins, potassium, calcium, and phosphorous. These leaves are known as overall nourishers and strengtheners and are full of vitamins and minerals like magnesium, calcium, iron, and protein. The health benefits of this tea are doubled because it combines the qualities of black tea and green tea. It contains vital vitamins and minerals such as calcium, manganese, copper, selenium, and potassium, as well as vitamin A, B, C, E, and vitamin K.
This leaf is a very rich source of beta-carotene, Vitamin C, fiber, potassium, iron, calcium, magnesium, zinc, and phosphorus. These berries have a pleasantly sweet-sour taste. They are rich in antioxidants, contain all 8 essential amino acids, and are a good source of protein and fiber. They are also low in Sodium, and very low in Saturated Fat and Cholesterol. Known as “the tea of the gods”, it contains vitamins A, C, E, B1, B2, niacin (B3), B5 and B complex. It also contains additional health-promoting compounds like carotene, fatty acids, chlorophyll, flavonols, polyphenols, inositol, trace minerals, antioxidants, tannins and at least 15 amino acids. This plant adds a fresh flavor and scent and is a a very good source of Iron, Potassium and Manganese. This herb is commonly used to detoxify the body. It contains Silymarin, which is packed with antioxidants. It gives your body a boost of clean energy for alertness and physical performance. It’s packed with Vitamins A & C, niacin, potassium, magnesium, iron, phosphorous, and zinc. It also gives a punch of fresh, fruity flavor. Unlike other peach powders, ours is completely corn-free! This root is one of the most popular herbal medicines in the world. It is considered an adaptogen, which means it helps the body withstand mental and physical stress. This natural sweetener has zero calories and won’t give you energy spikes or crashes. This popular tea contains potent antioxidants, including powerful EGCG (epigallocatechin gallate). It is also rich in fiber, chlorophyll and vitamin C, selenium, chromium, zinc, and magnesium.